Seth Rogen has certainly proven himself to Hollywood. He started acting in silly comedies and even worked up into writing them. Heck, last year he even started directing. His directorial debut “This is the End” was a hilarious mix of meta Hollywood humor, fantasy-horror, and disaster flick that was hysterical and satirical. It was a movie that felt larger than life. It makes sense that his next feature with co-director Evan Goldberg (though Dan Sterling gets sole screenwriting credit here) would try to top it. And they certainly have. While “The Interview” isn’t necessarily better than “This is the End” it shows so much more promise that Rogen and Goldberg are certainly creative forces to be reckoned with. And they’re certainly not scared of the evil dictatorship that they mock incessantly in it. 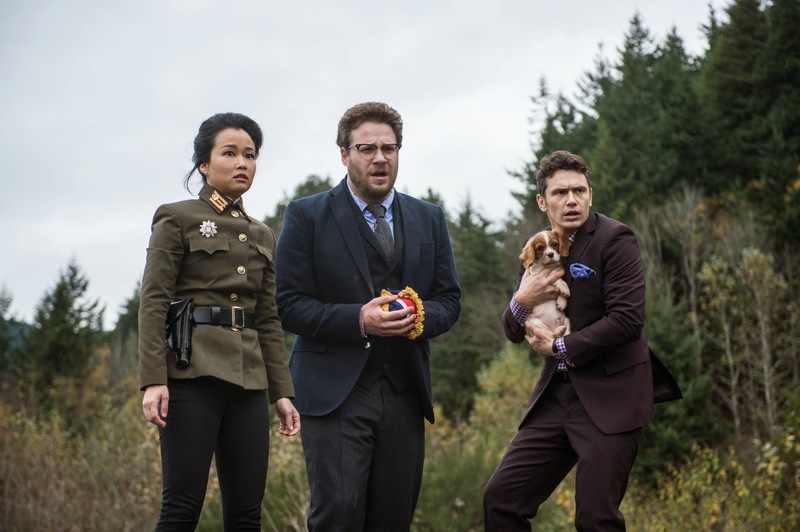 In “The Interview” Rogen plays Aaron Rapoport the producer of an entertainment talk show called Skylark Tonight. The onscreen host Dave Skylark, played by James Franco, and he’s as outrageous, cocky, and stupid as you would expect the host of this type of show to be. In fact I’m pretty certain that Rogen and Goldberg are more interested in mocking the American media and the entertainment industry more than they want to mock North Korea. Speaking of North Korea, it turns out that their supreme leader Kim Jong-un (Randall Park) just so happens to be a big fan of Skylark Tonight and wants to appear on the program. Being one of those reclusive leaders, Aaron and Dave plan to fly out to North Korea to induct what is sure to be the biggest interview of their careers. When Aaron and Dave get to North Korea they’re sort of surprised. Aaron is quickly taken in by his surroundings as everything seems pretty normal. He even meets Kim Jong-un face to face and he seems like a pretty cool guy. They hang out, play basketball, and even get with the ladies. Aaron, who is the obvious intelligence of the duo, sees right through the dictator as he’s known as a master manipulator. Will Aaron get it together or will he have trouble assassinating the guy who’s starting to become friends with? Trailer for The Interview on TrailerAddict.